Do you need 2 appointments for Vientiane? Ok we have an appointment but the school asked if we book another appointment to get back the passport?! I never read about that , and I thought you pick it anyway next day ? Another thing, we have to apply on Friday, pick it on Monday right? (But they say there is a holiday on that Monday 8 April, which in the website of that embassy I do not see as a holiday) . how do we know? And is there a way not to wait the weekend ? You do not need an appointment to pick up your passport. You will use the same number given you. Sometimes they do them the same day if they are done just before a holiday. If not you will have to wait until Tuesday to pick it up. thanks . So is it a holiday on Monday ? the website says there is no holiday that day (till the water holiday). It is a better chance since apparently Monday the 8th is a unannounced holiday for the embassy. It looks like that it is a official holiday on 08/04/2019. My Bangkok Bank calendar shows official holiday that day, also internet confirm that holiday. That is already a known fact but it not shown on Vientiane's holiday list or calendar. It is only shown on the appointment website as a holiday. 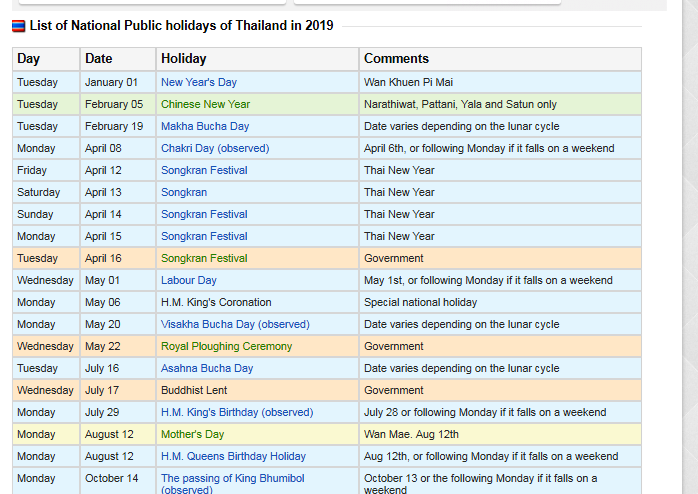 Embassies and consulate do not close on every official Thai holiday to balance out the number of days closed over the year since they also close for local holidays for where they are located. Just checked the Savannakhet consulate's calendar and it is shown as a holiday. So if it is a holiday there is a chance for same day? How can you know that in advance? Or only when you give your passport? Can i ask? Saying I need to leave before Tuesday due to a flight? Also , a fast process reduce chances for rejection or increase? So if it is a holiday there is a chance for same day? How can you know that in advance? You can ask about it when you do the application or try to contact them in advance about it. Very unlikely at best! If the embassy is closed on short notice for another reason, such as the recent election (advance voting for Thais abroad), they might do that, but not otherwise I'd think.